Earlier this year, we ran a scholarship campaign that enabled more than 160 girls to attend iD Tech Camps—our flagship, co-ed, summer tech program for ages 7-17—for free. The initiative was designed to engage more girls in technology, given that over 50% of the US population is female, yet only 14% of computer science majors are women. If men code the overwhelming majority of the world's technologies, everything will have a male perspective—and women will continually miss out on opportunities to innovate and create change in STEM fields and beyond. It's time to balance the scales. During the campaign, we received over 750 scholarship applications and were inspired, touched, and uplifted by the applicants' enthusiasm for tech education. 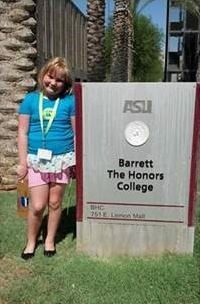 One scholarship recipient, Annabelle, and her grandmother, Cathy, traveled from the all the way from California's East Bay to Arizona so Annabelle could attend iD Tech Camps held at ASU. Prior to camp, Cathy described her granddaughter as imaginative, intelligent, and ready to expand upon her love for computers. During the weeklong camp session, Annabelle was able to kickstart a bright future in STEM. According to one of our main office staffers, "Cathy reached out to tell us how much fun Annabelle was having, and how wonderful the iD Tech Camps instructors at ASU were." This is what we strive for each and every day at camp. Annabelle proudly displays her iD diploma. Way to go! Across the US and around the world, girls like Annabelle are discovering their love for tech and paving the way for college and futures in fields like robotics, coding, app development, web design, 3D modeling & animation, film, photography, and more. 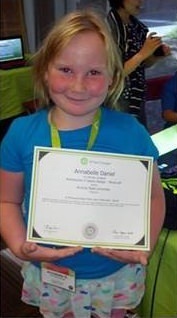 We're thrilled that Annabelle had such a great experience at iD Tech Camps. Want to join the fun? Register online here—there's a still a little space left at select locations nationwide.